Acetylene reduction activities (ARAs) of soils and rice plants during rice-growing season were monitored in temperate region in northeast China. This activity was significantly higher in rhizosphere soil than that in inter-row soil after rice seedlings were transplanted. The ARA was high for most of growing season, suggesting that the native N2-fixing bacteria responded to rice roots very quickly. Sixteen strains of free-living N2-fixing bacteria were isolated from three different soils. 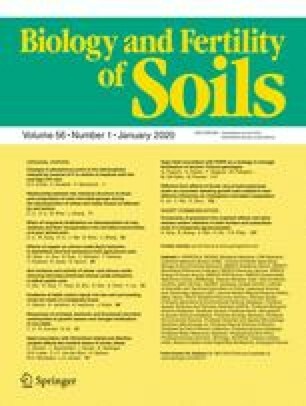 The ARAs of these strains were correlated with the averaged soil ARAs, suggesting that the isolated strains were likely the active flora responsive to rice roots. The strains were inoculated by soaking seedling roots into the liquid culture for 2 h, and the seedlings were transplanted into pots. Most strains tested did not show any growth-promoting effects except Azotobacter armeniacus and Azotobacter nigricans, which showed growth-promoting effects only at late rice growth stage and only when inoculated in combination but not separately. Present data indicated the promising future applications of these two strains in combination in the region, but further research is needed to understand the underlying mechanisms. Financial supports from National Natural Science Foundation of China (40471072 and 30470060) and the National High Technology Research and Development Program of China (2002AA601012) are acknowledged. Author Zhe Piao is indebted to Prof. M.Y. Cai, Institute of Microbiology, Chinese Academy of Sciences, Beijing, for her identification of the strains and for her helpful discussions on biological nitrogen fixation, Mr. Z.X. Jin and Prof. C.H. Cui (Northeast Agricultural College), Ms. Y.H. Guo (Shenyang Agricultural College), Mr. Y.Z. Sun and Mr. T.Y. Shi (Yanbian Agricultural College) for their help in sampling.